... SpellBinder has produced numerous Grand Champion & first place crias for us in both Halter & Fiber through 2011! His solid genetics sure pays off. Six of the ten ranch bred crias have been Champions!!! SpellBinder is a Senior Wenses son. SpellBinder was purchased by FALLEN OAK in 2001. Though he was already 7 years old, he had been under utilized as a Herdsire, only siring 3 cria. SpellBinder is very athletic and muscular. A definite powerhouse! SpellBinder is only 39 inches at the withers. He does not throw his size in his offspring as a vast majority of them exceed his size by far. SpellBinder passes on his silky soft fiber, great head & tail set and his great presence. On oral presentations, judges often refer to his offspring as 'flashy'. 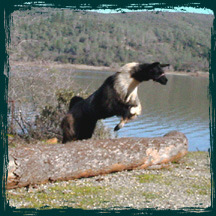 As of 2012, SpellBinder has produced 10 offspring - while at Fallen Oak- 5 male, 3 female. 7 crias have silky fiber. Most of his cria have at least one blue ribbon in halter! Each cria's height reflects their dam, from miniature to 45+ inches at the withers. In October 2005, SpellBinder was shown at the Harvest Festival. It was SpellBinder's first show EVER! ... at the age of 12. 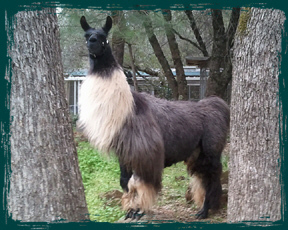 Every other llama in his halter class was 3 & 4 years old. 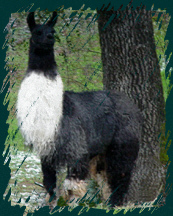 SpellBinder PLACED 5TH, over much younger & well known llamas .